I haven’t quite switched my wardrobe toward fall weather. I’m trying to put off sweater season for a few more weeks. But my cooking style has definitely changed toward heartier fare. I just feel bad that I haven’t been sharing more of it here. Tonight I have pictures from two recent meals. The meatloaf was a few nights back, but tonight I decided to roast a chicken. It was my writing day, so I spent nearly the entire day sitting at a computer reading and typing. Taking breaks to work in the kitchen was a pleasant diversion. The more interesting dish, though, was a zucchini and potato gratin. 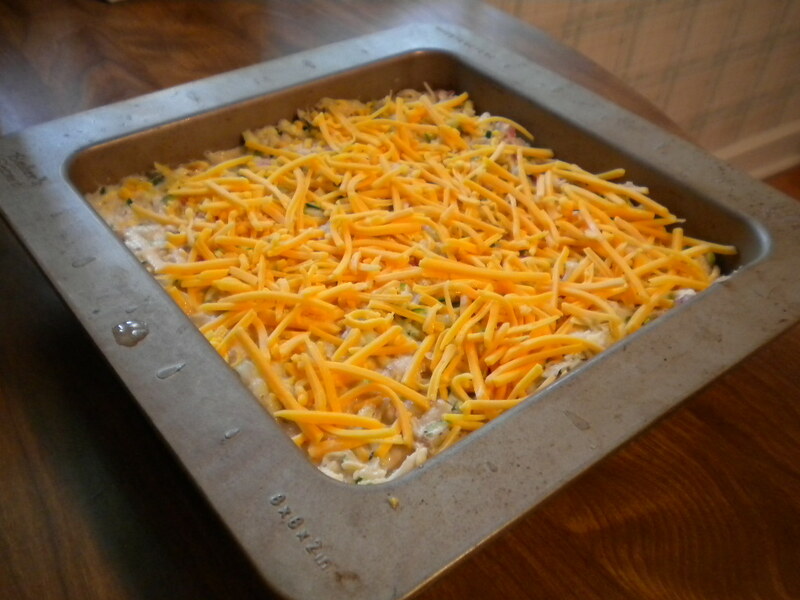 Recipe wise, it was simple as could be – just shredded veggies, cream, salt, pepper, and cheese, baked at 350 for about a half hour. In all honesty, I wasn’t 100% thrilled by the way it turned out. I think the zucchini to potato ratio was just too high. But it did use up some of this week’s rather large allocation of zucchini. Meanwhile, a long evening of simmering has left us with some delicious chicken broth (also using up quite a few veggies, including radish greens! ), and the leftover chicken will be a major ingredient in meals all week. It was a good start to the new week – hope everyone else had a good Monday! This entry was posted in General on September 12, 2011 by theneighborboys. This looks like a weekend meal that I could make and then reheat- some of my favorite meals in life have included meatloaf! I think I will just make regular mashed potatoes and have zucchini on the side. And our Mom always made a sort of glaze of ketchup, brown sugar and a big tablespoon of mustard that she put over the meatloaf during the last half hour. It was always great! I have not thought about meatloaf for a long time! (All summer.) That is one of Bob’s favorite leftovers. A cold sandwich. Yours looks great. I think I might try the bacon on top for a change. I like putting zucchini in it too. Nobody can tell! Is that a special kind of pan that you used for the gratin? It looks different. That dish looks really tasty too! Yummmmmm. I love meatloaf! Especially with bacon on top. 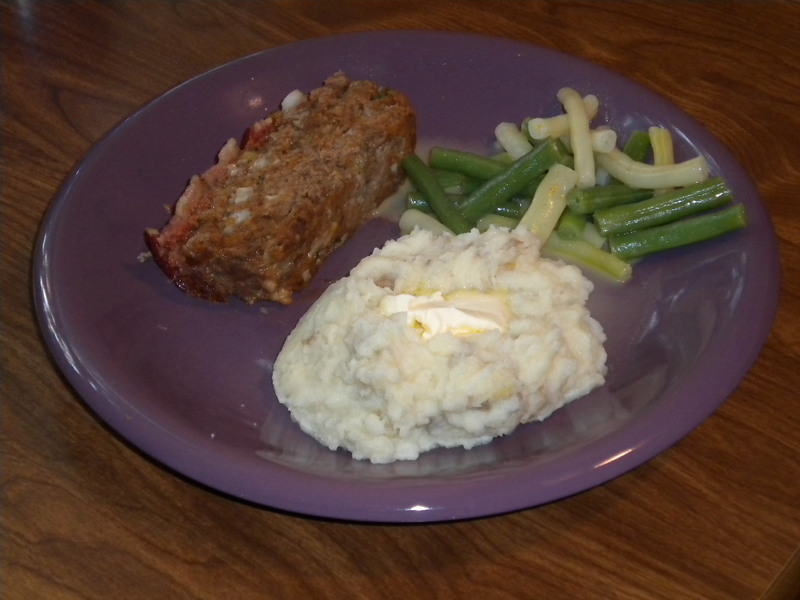 I agree – the joy of meatloaf is getting to eat it several times over the course of a week. I think the majority of people put some kind of glaze on it. My mom never did, though, and I carry on in that tradition – just add ketchup and all is well! Beth, I was nearly too embarrassed to post the picture of that beat up old pan. It’s just an 8×8 metal pan that I’ve had for many years. I’m not sure why it has that wide rim, but it is a bit different. Just one of my go-to dishes for smaller casseroles and the like. That is just what I liked about that pan. The wide edges and the size of it. It is really getting into casserole and soup time now!